In 1972, a young man named Hank Prussing visited East Harlem to examine the area's public art for a class he was taking at the Pratt Institute. After a local pastor suggested that he create his own mural in the neighborhood, Prussing started working on The Spirit of East Harlem, about half of which you can see above, in 1973. Manny Vega, a neighborhood kid, regularly walked by the building and saw Prussing up on a scaffold, painting. He became his apprentice after calling out to him one day: "Hey, white boy! Give me a job!" Vega later restored the faded artwork in 1998-99, adding some touches of his own. Parts of the mural disappeared a couple of years ago when some sections of the brick wall were replaced, but you can view an interactive photo of the whole thing before that happened here. 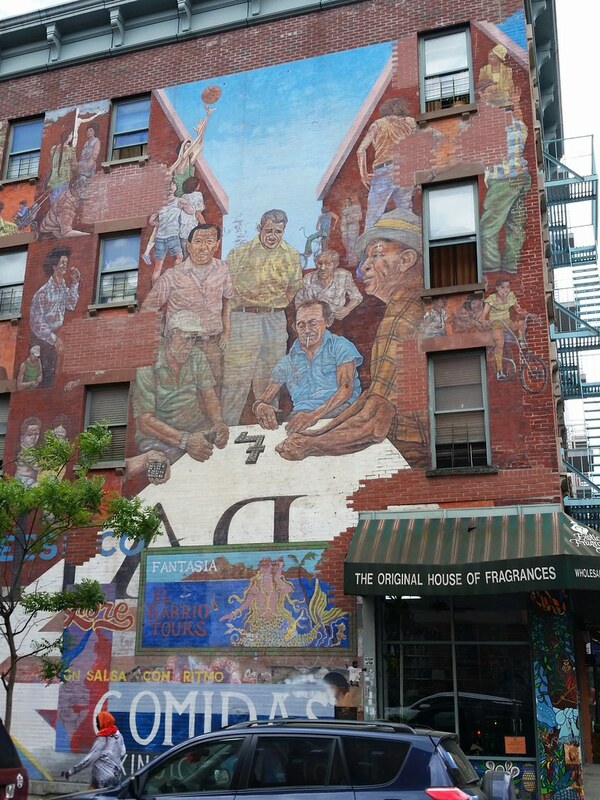 Until 1973, people portrayed in New York City murals were either historic and contemporary public figures or symbolic representations of neighborhood residents. The earliest portraits of actual members of the community are found in the murals of Hank Prussing and Lucy Mahler. For his grand The Spirit of East Harlem (1973-78), artist/architect Hank Prussing spent several days and evenings taking random photographs around the mural's location, on East 104th Street at Lexington Avenue. The character, pride, and individuality of the area's Puerto Rican residents is beautifully and sensitively rendered in his life-sized and oversized portraits. The neighborhood itself is represented by a trompe l'oeil landscape of tenement buildings. Prussing sought "to celebrate the people of this particular community as they were in everyday life" rather than to create "a mural that celebrates a people's heritage and/or aspirations."